THIS WEEKEND ONLY!!! 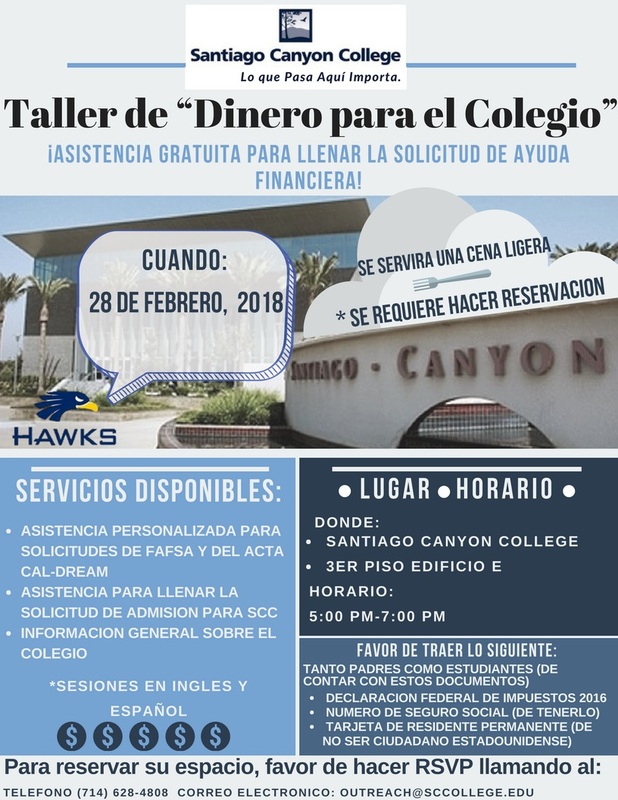 Santiago Canyon College is will be hosting a Cash for College workshop on February 28th from 5:00pm to 7:00pm on the SCC campus for all seniors who still need to complete their financial aid application and need help. The Financial Aid Office and Outreach Department will be helping students complete the FAFSA or Dream Act step-by-step. Food will be provided. We will have Spanish and Chinese speaking staff to help assist if needed. RSVP is required so please have your students sign up and direct any further questions to outreach@sccollege.edu or call our office at 714-628-4808. 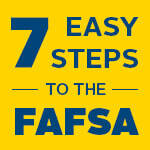 ​The FAFSA is the Free Application for Federal Student Aid. Anyone who wants financial aid ​for college or trade school will need to fill out the FAFSA. The application is used to determine the dollar amount you or your family will be expected to contribute towards college. All federal grant and loan awards are determined by the FAFSA, and nearly all colleges use the FAFSA as the basis for their own financial aid awards. The FAFSA or Free Application For Federal Student Aid Is the central application from which most post-graduation institutions in the US get your information when awarding financial aid. Many post-graduation institutions will not award financial aid if the student has not completed the FAFSA. This includes academic merit based aid and need (income) based aid. Career schools (Trade schools, etc…) and programs and college/universities offer Financial aid through the FAFSA. Make sure you contact with your chosen post-graduation institutions to verify if they offer financial aid through the FAFSA. You’ll be surprised by how many do. The FAFSA can be completed in less than 1.5 hrs online at www.FAFSA.gov. Make sure you apply by March 2, 2018!!! File the FAFSA now and be prepared in case of a financial crisis should one occur after you start training or studies. Apply even if you think you make too much money due several reasons above. Also, students attending institutions with higher cost may need aid even though their families can contribute a significant portion of the cost.